A Daydreamer has a challenge that will go great with my Genre/Sub-Genre challenge. . . The challenge is to read a large variety of genres within one year. Runs from January 1st 2013 until December 31st 2013. Sign ups will be open until December 1st 2013. There are five levels to challenge yourself too. You may move up a level but not go down a level. These are all outlined below. Please mention in your sign up post which level you will aim for. The genres you choose to read are up to you. As long as every book is different, whichever genre you wish to read you can. There will be a giveaway at the end of the challenge, and maybe a few within the year but these are TBD. To sign up, you will need to write a post saying which level you are challenging yourself too and then use the linky list. Non-Bloggers may post in the comments of this post. Any book formats are accepted. 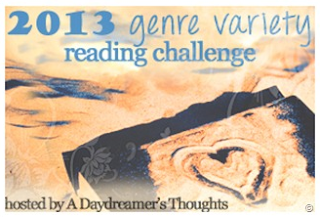 Novellas and Novels are all accepted for this challenge. YA, NA and Adult books all count towards this challenge. I'm going for Careful and will read 6 books of different genres. Crossing my fingers that I go up a level.